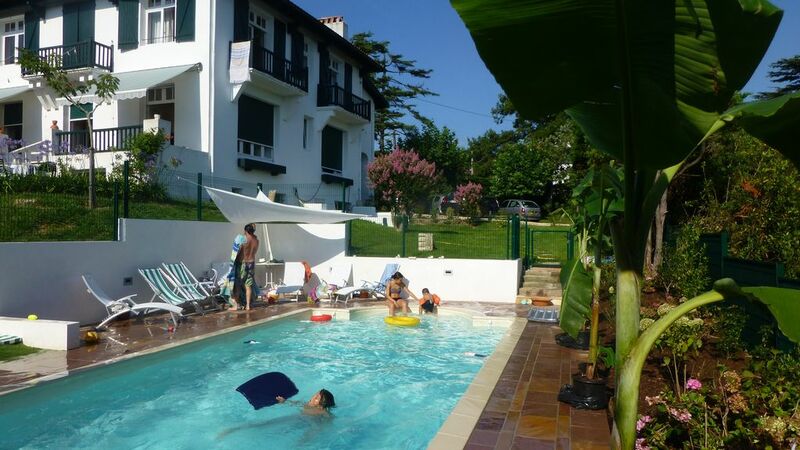 Flournoy Villa is ideal for family holidays or friends. Its proximity to the beach and shops (mini market, newspapers) makes the car useless ..... including to go downtown, 10 'walk! perfectly equipped for babies (crib, cot, changing table, high chair ...), for older (games room, trampoline and swings ..) and teens (home theater / DVD / WIFI and table tennis), the villa is all your expectations of comfort. With its spacious living room, fireplace and a large terrace facing the Rhune and the Three Crowns, Villa Flournoy reserve adults a haven of peace sunny. (Electrical shutter + fence), its century-old magnolia and BBQ, all offer a great feel of space. 8-10 parking spaces are available in the gravel yard. The very full house equipment used to organize dinners and memorable parties in the dining room, on the terraces or in the event of excessive heat (or rain ...) on the porch. HIGH ON THE TERRACE, 2 TABLES AND CHAIRS 16 FULL BREAKFAST ALLOW SUN HOUSES BY ELECTRICAL BLINDS IF LARGE HEAT YOU CAN INSTALL 16 ADULTS UNDER THE GRAND PORCH. YOU CAN RENT THE MACHINE; POSSIBILITY OF HOUSEHOLD = LUZ SERVICE, SESAME SERVICE. IF MORE RENTALS 1 SINGLE PERSON MUSTbe RESPONSIBLE AND CONTACT ONLY FOR PAYMENT, DEPOSIT AND FINAL SETTLEMENT. THE START OF TENANTS A PLACE AT THE LATEST ARRIVAL 10pm and A 16 HOURS. IN A PROTECTED AREA OF ARCHITECTURAL HERITAGE AND LANDSCAPE BASQUE COAST. IT'S A DREAM PLACE RIGHT IN SILENCE AND SUNLIGHT FACING MOUNTAINS AND TO BAY, A 2 SHOPS, THE BEACH AND THE CITY.